From the creators of Robot Chicken comes Star Wars Robot Chicken that is a parody of George Lucas' acclaim Star Wars series and actually even got the thumbs up by Lucasfilms. From dance to song and even George W. Bush as a Jedi, this parody of the Star Wars franchise is easily one of the most entertaining things that I have seen in a long time. For those unaware of the Robot Chicken series, the creators use a variety of action figures and also customized action figures to create a variety of skits and parodies through stop motion video. 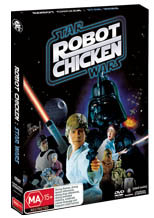 The Star Wars Robot Chicken episode follows a 56-page script that took months to create and was actually shown at Lucas Ranch before its release. My favourite moment of the DVD is a Star Wars fan who dresses as a Tantan for a convention and stumbles upon George Lucas who is actually played by George himself and when a room full of fans start chasing him, the fan gracefully asks this Oscar Winning director to climb onboard. Needless to say, it was the greatest moment of his life! Whether it's the Admiral Ackbar cereal commercial or Jar Jar annoying the "hell" out of Darth Vader through his "Ani" comments, this is definitely one for the Star Wars fans. It's witty, it's adult and best of all, it's funny from start to finish. Although the main feature is rather short (just under 25 minutes), the disc virtually contains a plethora of highly entertaining extras that are almost as good as the feature itself. Seth Green (Austin Powers) is joined by a variety of writers and actors to truly make a unique parody of the Star Wars franchise that we could happily recommend to all.